It is with very little fanfare that I present this delicious cake to you without any accompanying photos, sans the one you see above. You see, I did not initially plan on sharing this cake with you all. This was a cake made for a birthday, and I went about creating it with simply the desires of the birthday person in mind, and not the requirements of a certain food-based website in mind. I baked it like I used to bake everything: without a camera at the ready. And yet, please believe me when I tell you that this cake, this burst of coconut delight and citrusy cream, is one of the best cakes I have ever made. 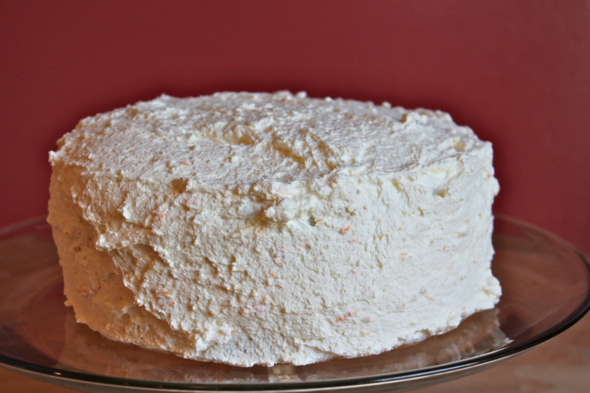 The yogurt and extra egg whites in the cake make for an especially light crumb, and the surrounding cloak of orange zest infused whipped cream provides the perfect amount of decadence without any element of heaviness. It’s what I always tend to think of as a grown up cake, meaning, the type of cake that a child would reject in a second (and, in this case, most did), but an adult would welcome with open arms (and open mouth). No matter, of course. Whatever the kids don’t eat, that just leaves more for the rest of us. Preheat oven to 350 degrees Fahrenheit. Grease and flour two 8-inch round cake pans, then line the bottoms of the pans with rounds of parchment paper. In a large bowl, or in the bowl of stand mixer, beat the butter until creamy, about 60 seconds. Slowly add the sugar, and beat together until light and fluffy, about 3 minutes. One at a time, add the egg, then the egg whites, beating about 15 seconds in between each addition. Scrape down the sides of the bowl if things resist mixing together. Beat in the vanilla. With the mixer on low, beat in 1/3 of the flour mixture, then beat in the yogurt. Scrape down the sides of the bowl, then beat in half of the remaining flour mixture, followed by the coconut milk. Add in the last of the flour mixture, then mix until just combined. Beat in the coconut until just incorporated, about 10 seconds. You don’t want to overmix the cake batter, so use a gentle hand with all the incorporating of the ingredients. Divide the batter evenly between the two prepared pans. Bake in the center of the oven for 22 to 30 minutes, rotating the pans halfway through baking.The cakes will be done when a toothpick or cake tester inserted into the center of a cake emerges somewhat clean, with just a crumb or two attached. Allow the cakes to cool in the pans for 10 minutes, then invert the cakes onto a wire rack to continue cooling completely. To make the frosting, in a stand mixer, or using an electric mixer, beat the cream on high speed until it just begins to thicken. Drizzle in the powdered sugar, then vanilla, and continue to beat until the cream forms soft peaks. Add in the orange zest, and beat in until just combined. You can beat the cream until it forms firm peaks, as I did here, if you will need the cake to sit for a bit before eating it. However, if you will be eating the cake right away, and the cream will not be in danger of weeping, I’d go for light and soft peaks in the whipped cream. When the cakes have cooled completely, frost with orange cream frosting as you would any other two-layer cake.